Hey ya all! I should be in bed but I am surfing the net instead looking for some good deals. We have tighten the belt on our spending now though. I always love to move because it means I can always spend money on stuff I would never other wise be able to. New nests always need new pretties right!? So even though we are now making ourselves short on cash per say I am still on he prowl for some great finds. Sometimes if I ask really nicely and make a good case for something the Hubster gives in. My motto is " You have to spend money to save money" wink wink! So here are a few things I have found thus far. If only I had found theses two weeks ago! 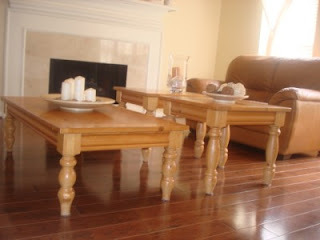 I love the turn legs and soo can see them painted black and distressed! A steal at just $100 for all three tables. 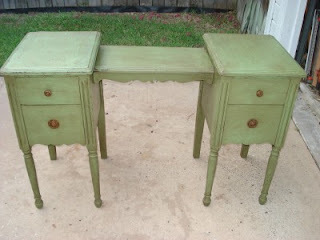 Love love love this antique desk! The color is actually scrumptious and I would need to do nothing to it. I think it would make a great sewing table. Just $59. A bit up there but I will keep my eye on it. Now look at this great light fixture! I purchased a 6 light chandy a few weeks back that is waiting to be placed in the breakfast nook. I will share pics once I actually talk somebody into hanging it for me. There is a debate over it because of the way I have the breakfast area staged the light will have to be swagged. My father-in-law and well my mother-in-law and the Hubster all are having a cow that I would even think to swag a light. My mom says swag it! I say hey it is much better than moving the light all together! Have any of you swagged?? In the end I will win this battle! 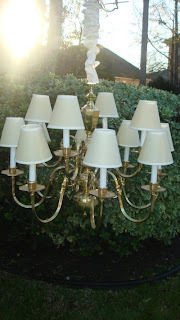 Anyways,this chandy would be awesome in the dinning room! A can of spray paint and some new shades or re purposed shades and she will be gorgeous!! I am actually having a hard time finding chandys that require shades. Most of them these days have globes. This one is $40 which is a bit much. I did email the seller and offered $20 for it. Can't wait to see what she says. It has been up for a few days now so just maybe! Okay, off to check in on the babes fast asleep upstairs and hopefully soon will find myself asleep as well! Have a good one ya all! Thank you for stopping by my blog. I always love meeting new people! Those tables in the first pic are wonderful! Just my style. I love the desk too. And the chandie is fab...I think swagging it will look great! Did you see that I have sold my house and am in the process of buying a new one? I agree with you...a new house is a great excuse to buy new (old) things! You have been crazy busy! That house will be "done" in no time!